The OFT team would like to congratulate CeRDI researchers, Judi Walters, Robert Milne and Assoc Prof Helen Thompson who recently published an OFT-focused article in the Rural Extension and Innovation Systems journal. Further details of the article can be found in the citation below. Walters, Judi; Milne, Robert and Thompson, Helen. 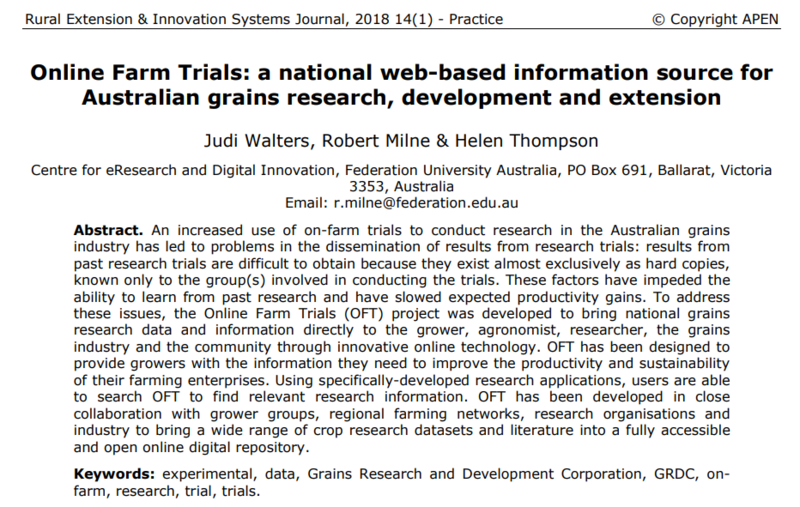 Online farm trials: A national web-based information source for Australian grains research, development and extension [online].Rural Extension and Innovation Systems Journal, Vol. 14, No. 1, 2018: 117-123.